Get your Invisalign treatment done with an Orthodontic Specialist. Your smile with thank you. You might think orthodontists always install classic metal braces seen by many teenagers. This image does describe the majority of orthodontic patients. Yet, there is a new option that is gaining popularity over the classic metal braces. It is called Invisalign® clear aligners. Invisalign clear aligners are composed of polyurethane plastic that is hardly noticeable. Invisalign is not cemented or bonded to your teeth like metal or clear braces. These clear aligners are easily removable and useful in social settings, eating, brushing teeth, and flossing. It is so easy to take out the Invisalign trays that it might make you want to remove them more often than is recommended. Unfortunately, keeping them out of your mouth will slow down the process of straightening your teeth. Let’s talk about more of the positive aspects of Invisalign. Improved Oral Hygiene—Since Invisalign is removable, you can brush your teeth easier than traditional metal braces that are bonded to your teeth. A Discreet Look—These clear aligners are a discrete orthodontic treatment that will not change your self-image. Invisalign is a barely seen form of orthodontic treatment that can fit into your professional life well. More Dietary Choices— With regular metal braces, you have to modify your diet to protect metal wires and brackets. Yet, clear aligners give you the freedom to maintain the same diet. You can even eat apples and pizza. Comfort—Invisalign is composed of malleable plastic that will not irritate your gums and cheeks like metal braces may. Teeth-Grinding Protection— If you tend to clench or grind your teeth, Invisalign works as a nightguard that can shield your teeth from wearing down. Clear aligner technology is continually improving and helps with poorly aligned bites that use to be too difficult to treat with Invisalign. However, metal braces work most efficiently for some prognoses. We can talk and see if clear aligners are right for you. Invisalign clear aligners function just like traditional braces. They apply small amounts of pressure to teeth in order to move them into alignment. The difference is that they do not contain metal. They consist of invisible, malleable plastic. The Process: We compose a plan to align your teeth utilizing specialized computer software that designs your specific treatment regime. The process will be divided into many stages. At every stage, the Invisalign team will produce two plastic mouth aligners for your bottom and top teeth. The initial aligners are for two weeks and you need to wear them for at least 20 hours a day. Then, you will progress to the next trays that shift your teeth a small amount. This process will continue until your teeth are straightened. Now Invisalign is a successful option for teenagers due to two modifications. Teenage molars may not have come in so Invisalign has created “eruption tabs” that leave room for the teeth to move into position. 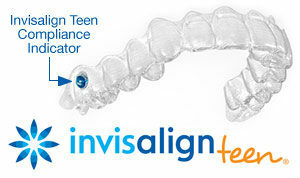 Invisalign for teens built “compliance indicators” into the clear plastic that become paler during use. Therefore, teenagers, parents, and orthodontist can see how often the trays are worn. Invisalign is only successful if the clear alignment trays are worn consistently. As previously stated, one beauty of Invisalign trays is that they can be taken out easily for cleaning. Make sure you do that. After any time you eat, you will need to brush your teeth to prevent plaque and food from being stuck in the trays. Trapped food may cause tooth decay and gum disease. You must clean your aligners consistently. You can clean your tray by brushing and rinsing them off in tepid water. It is important to note that Invisalign is a different process than wearing braces. But maintaining your finished alignment is just as important. Always wear your retainers following the orthodontist’s recommendations post treatment to keep your perfect new smile.